Barcodes in Wheat, Barley, and Oats? The beautiful, dry sunny weather with high winds this past week and weekend has allowed many of you to make great strides with planting. Unfortunately this also exposed young small grain seedlings to same conditions. 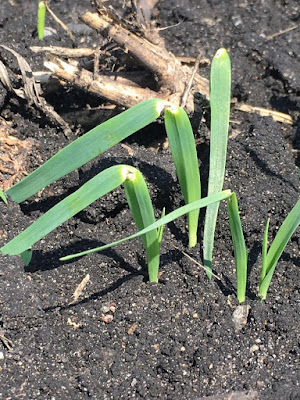 The daytime heat at the soil surface can and has caused heat canker. The tender young tissue at the soil surface basically has been 'cooked' and this appears as a yellow band that is slightly constricted (Photo 1). As the leaf continues to grow, this yellow band (1/8 - 1/4") moves upward and away from the soil surface. If the hot and dry weather last for several days, its is possible to see repeated bands, much like a barcode. The damage is nicely depicted on page 81 of the second edition of the Small Grains Field Guide. Because of the high winds, the tips of leaves may fall over or even break off at the yellow band and give a field a very ragged appearance. Damage from heat canker is temporary and should not affect further growth and development.